The idea of an English parliament has been strongly rejected by Lord Chancellor Lord Falconer in a speech to a conference on devolution. He said such an institution would lead to the break up of the UK. Conservative frontbencher Oliver Heald said he too was against an English parliament but wanted England-only votes at Westminster. He said it was wrong that Scottish and Welsh MPs could vote on some English matters but not vice versa. Following devolution, the Scottish Parliament in Edinburgh and the Welsh Assembly Cardiff decide issues such as health, education and transport. But Scottish and Welsh MPs continue to sit at Westminster and vote on issues only affecting England, such as university top-up fees and the recent smoking ban. Lord Falconer admitted devolution has created a "clear anomaly", but said it has to be resolved in "a way that most promotes the union". Steven Uncles, from the English Democrats Party, which campaigns for an English parliament, said Lord Falconer's comments could inadvertently help his party's cause, as the Lord Chancellor is a Scot. "The way the English mentality is, as soon as a Scotsman says you cannot do something that will make the English sit up and say we want to do it," he said. He said it was wrong for Lord Falconer to accept there was an anomaly but do nothing to rectify it. And he rejected the Tory idea of having England-only votes at Westminster, saying that effectively having two parliaments in the same building would cause problems. Shadow constitutional affairs secretary Mr Heald said the Education Bill, which only applies to schools in England, could go through only because of Scottish votes. He said English MPs should decide on English matters. "What we are saying is let the English members of parliament sit down together and decide what's best for England, in the context of the issues devolved to Scotland," he told BBC Radio 4's Today programme. Research showed English regions were losing out to Scotland when it came to economic development and that there had been a "strengthening of English identity since devolution", he said. It also showed "the English have different policy agendas from the Scots in areas such as health and education", Mr Heald argued. Lord Falconer agreed there was a "distinctive English agenda" in some policy areas but said it was "critical" to preserve the United Kingdom. "The argument for devolution was that the Scots and the Welsh felt policies could be imposed upon them for which there was little or no support in Scotland or Wales. That's why devolution was popular," Lord Falconer said. But because 80% of the population of the UK was English there was "absolutely no need for the sort of protection for the Scots and the Welsh by having their own parliament or assembly," he argued. It was possible that some decisions to be won with Scottish and Welsh votes despite only a minority of English MPs supporting them. But the chances were "very, very slight" as it was inconceivable political parties would not pitch their appeals to the English as so many voters and MPs were from England. 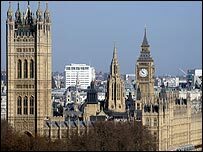 Having "two tiers of MPs" at Westminster would "promote separation" and be a step towards an over-mighty English Parliament which would "dwarf all other institutions", added Lord Falconer. Lord Falconer set out his arguments against an English Parliament in a speech to the Economic and Social Research Council. Liberal Democrat Shadow Constitutional Affairs Secretary, Simon Hughes said: "Lord Falconer and the government are putting their heads in the sand. "The present constitutional arrangements for making English decisions are unacceptable and need to be changed. "There may not be massive demand for an entirely separate and new English Parliament, but there is growing resentment at England-only issues being decided by politicians from other parts of the United Kingdom. "This issue will not go away, and the Liberal Democrats are determined to make sure it doesn't." Should there be an English parliament?